Introducing Telestr8 Mate: Another way of sharing images! 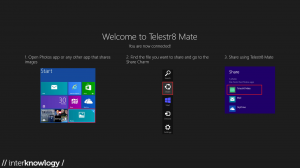 Telestr8 Mate is a WinRT (Windows Runtime) Application designed primarily to share pictures from your Photos Application or any photos-sharing application you have. Since Telestr8 Mate was also planned to be on Windows Store, there is a guide that comes along with the application. Also, when app is launched, there is a step-by-step instructions on how to go about using it. Telestr8 Mate is the companion app of Telestr8 (a desktop application). Telestr8 will be discussed on a blog post following this, but it is important to know that in order for Telestr8 Mate to function properly, you will need to download and install Telestr8 App, as well. 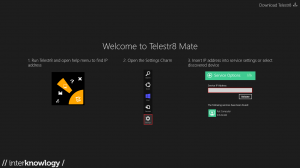 When app is launched, Telestr8 Mate provides a screen with instructions on how to connect to an IP Address where Telestr8 (A desktop application that I will discuss following this blog) is installed. a) Find out what IP Address Telestr8 is connected to by running the program and clicking on the settings button (computer icon). 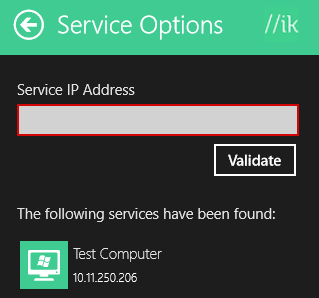 b) Go back to Telestr8 Mate, select the settings charm, go to service settings and put IP Address on the text box or select any discovered device that pops up below the validate button. Once Telestr8 Mate changed screen to “YOU ARE CONNECTED”, congratulations you are now ready to share your images to Telestr8. a) Find the image you want to share on your Photos Application. b) Click on Share charm and select Telestr8 Mate. d) You should be able to see the picture you shared on whatever device you installed Telestr8 in. The picture will appear at the top-right corner of Telestr8 app. As a developer, being able to work with WinRT application is a big deal. I had the chance to struggle figuring out Application Lifecycle: OnSuspended, OnResuming, OnLaunched and just about how will my breakpoints on OnResuming event will be hit. I learned how WinRT works by reading other’s blogs, thorough researching and just TRYING IT OUT MYSELF. Lastly, just a shout-out that following this post is Telestr8 App, so keep reading!